The sound of rain on the metal canopy of our balcony in Athens is a sound I grew up with. It is dynamic and soothing at the same time, very complex and rich. I recorded it as part of a very interesting evolving sonic environment, together with the drainpipe and the resonance of the neighbourhood, during a short autumn rainstorm. Scanning the whole event I was moving the microphone around, zooming into the flowing water, in and out of the house, until the rain stopped. Lasting about thirty minutes this recording was the first stage of the piece. I was seeing it as a slow moving, meditative, narrow-palette textural landscape, with big sparse gestures – thunder, heavy drain sounds and so on. I started folding the different sections into each other, shortening the duration. The number of layers, the type of cross-fade and amount of overlap and the length of each chunk varied depending on the mobility and density of the sound, the tension I wanted to create and its role in the course of the piece. I kept shortening the stable areas and removing smaller gestures until I reached the total duration of 5’58’’ with all the important elements still in place. Then, I expanded the material back to 12’27’’. We can see how sections relate between the two versions of the piece. I adapted the form of each version to accommodate all the important events at the desired energy levels. 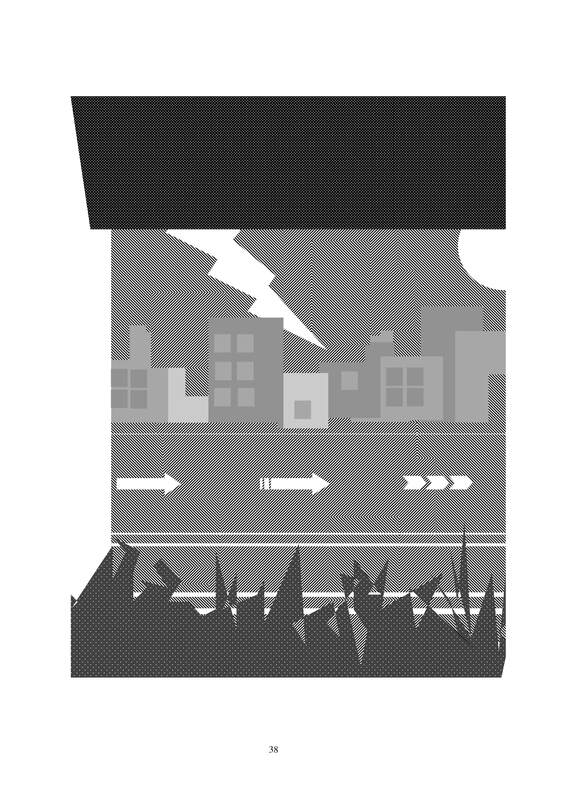 Nevertheless, the short piece feels faster, as it contains less static phases. 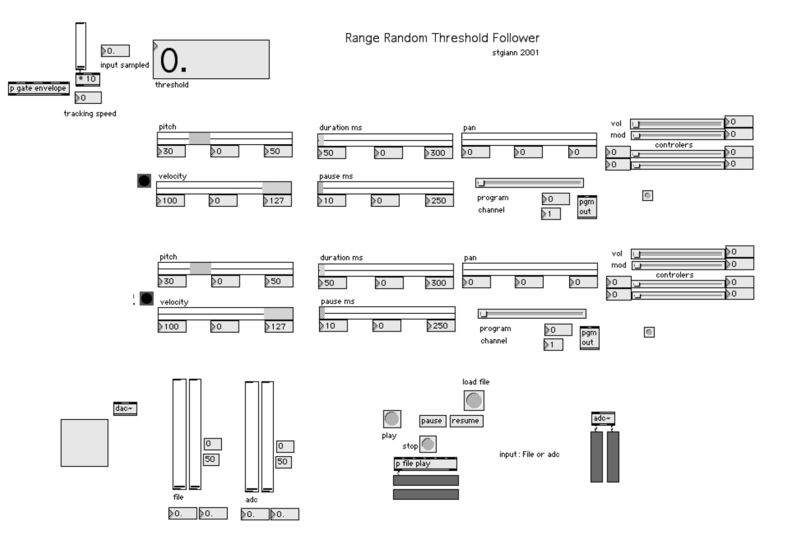 I modified the Range Random Sequencer used earlier, to play only when an input signal passes a real time controllable threshold. With this tool I created a piano texture that closely follows the rain and water sounds. In a further stage I applied continuous transformations. Playing with transposition, parametric equalisers, comb filtering, gates and phase changes I added subtle variation and internal articulation and made some directional transitions more convincing. After the rain, the sound of the last drops merges with the very similar sound of metal contraction – my gas fire cooling down. This is probably my most sculptural piece. I took a large chunk of raw material, carved it and trimmed parts, concentrating on significant points and areas of interest. I filled in with other relevant sounds (frying, gated noise, piano, gas fire) and I smoothed and coloured. This way I sculpted depth and musical direction on the natural sound, transferring attention to both detail and larger form. This entry was posted in about the pieces, electroacoustic, fusion and dialectic, music and tagged acousmatic, acousmatique, Athens, avant-garde, computer music, concrete, contemporary classical, counterpoint, cross fade, drainpipe, electroacoustic, electroacoustic music, electronic, Environment, experimental, fusion, max/msp, music, musique concrete, Rain, rainwater, relationships: fusion and dialectic, research, sonic art, sonic environment, sound design, sound diffusion, sound editing, sound of rain, stelios giannoulakis, the electroacoustic gallery, water sounds. Bookmark the permalink.